In most cases installing styles is as easy as double-clicking the styles pack that you unzip in your download or importing the pack directly from the presets panel in C1, which is also where you’ll apply presets to your images. See the image below. If you’re new to Capture One you should check out Phase One’s extensive C1 learning hub here. 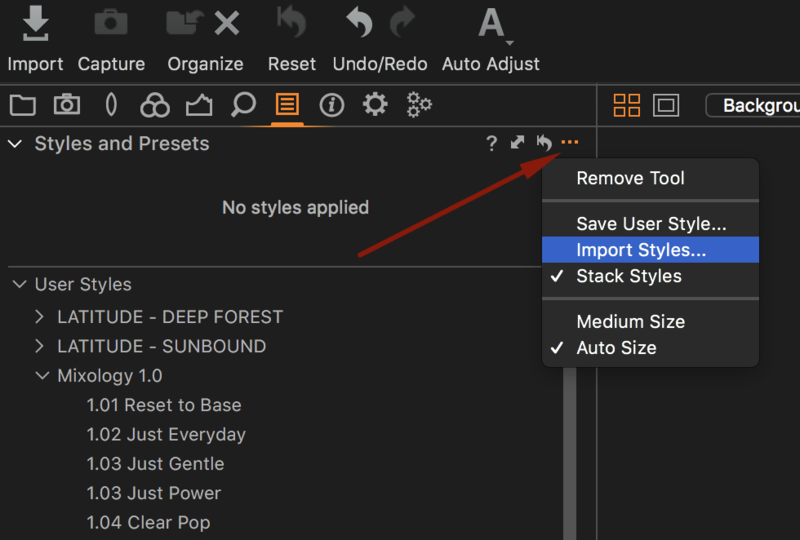 If you need to rearrange or delete compete for sets of style (for example you installed duplicates) C1 has not yet included that feature (I did ask them to( so you need to go directly to the folder where C1 stores the styles. 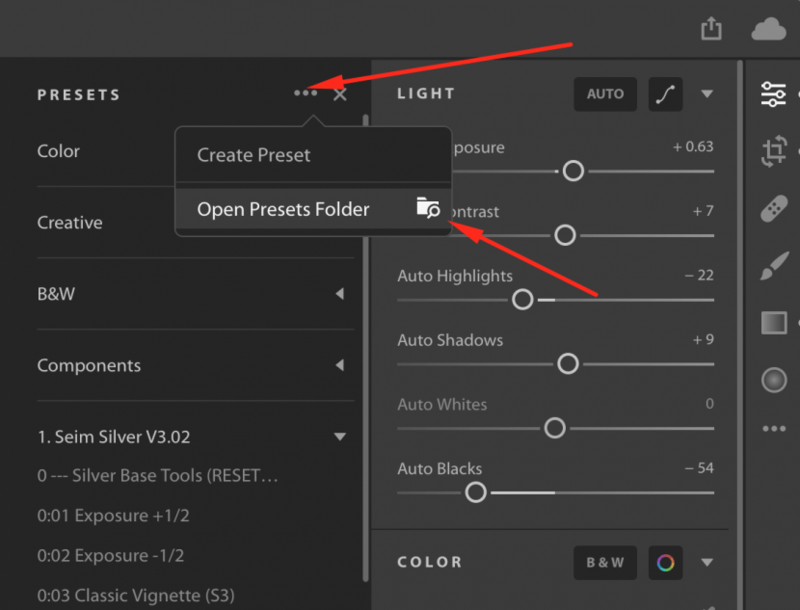 Note about Photoshop / Camera Raw: If you install the presets in Lightroom 7.3 or later using the method above they will actually update and install for Camera Raw. If you do not have Lightroom and only use Camera RAW you will need to install them manually. Simply copy the folder of presets files marked for Camera Raw into the Camera Raw settings folder. There’s a video about how to do that here. If you have Lightroom CC Classic (even if you don’t use it) you can use the Lightroom Presets install method above and it will install for Camera Raw as well. If you have never used presets in Camera Raw we made a video about that here. NOTE for Lightroom Cloud: Videos are made using Lightroom Classic. If you are using Lightroom CC (Cloud) the install location is slightly different as shown here. Everything else should be pretty much the same and works perfectly, though I find LR classic has a bit more control. Seim Effects Preset Guide: Whatever Seim Effects you use, this is the guide. A place to review features, what different effects do and how you can best use them. We’ll start with a legend of preset notations that you’ll find throughout various effect toolkit. These help you know what effects do so you can better mix match and manage. If your updating to a newer version there is no need to keep the existing version. New versions, including minor updates, include the current complete collection of effects. The easiest way is to simply delete the old set and load the new. The meaning of notations you may see on various Lightroom presets. RESET Buttons: Reset Presets are buttons that do just what the name implies. Each category header that includes the term RESET will offer this feature. This means is always easily accessible. Use reset’s liberaly. Sometimes when you start blending various effects things will go the wrong direction. The general rule is if something starts looking bad. Simply reset and try something new. Reset Presets reset all settings “except” Crop – Lens Corrections – Brushes. This allows you to reset effects on an image without changing trimming and lens profiles. If you want to truly fully reset “everything” just use the built-in LR shortcut – SHIFT+CMD (CNTRL) +R. Other Effect Notations: These are added after the name of the present to indicate helpful info on what the preset does. this is is especially useful when mixing and matching. (Cp): These effects take channel processing further by altering Camera Calibration settings. They can be mixed with nearly any other effect. (L) Presets: G notation indicates that the effect applies a local adjustment such as a gradient or radial. These can be edited once applied with the M key for grads and the Sift _+ M key for gradients. (V) Presets: The V notion indicates that the preset includes a vignette. TONE Presets: Presets labeled “TONE” do one thing: they overlay a unique color tint onto an image. They are meant to be added to give a color hue such as Sepia or Selenium but do so without affecting other settings. A small percentage of users experience a problem unzipping the downloaded file. This appears to be due to an issue with their unzip utility and generally occurs only on Windows Vista or XP. Following the instructions below should resolve the issue. 1: Delete all partially unzipped or error files and re-download the package. 3. Unzip the downloaded file using Zipeg rather than your built-in zip utility. This usually resolves any issues and your effects will unzip correctly. This is usually because you’re working with a 16bit file instead of an 8bit. Some PS tools (Diffuse Glow for example) will not work on 16bit files and you’ll receive action errors. To correct this you can go to the menu under Image/Mode and convert to 8 bits before running the desired action. Also if editing from Lightroom you can set preferences to open files in 8bit instead of 16. I’ll often use 16bit to bring out dynamic range, but then go to 8bit for final edits because it’s much faster and avoids errors. This can occur on older machines when Windows detects a file type that raises a flag. The fix can be found on this Microsoft Help page. I’ve noted the primary resolve below. 1. Right-click the blocked file, and then click Properties. 2. In the General tab, click Unblock. If you have any issues you don’t see an answer to, don’t hesitate to contact us. Seriously we are here to help.